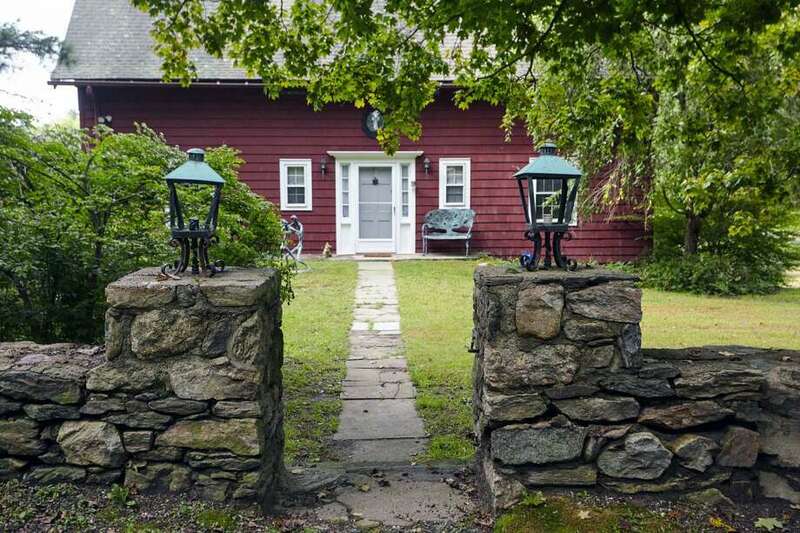 The barn-style colonial house with a gambrel roof at 69 Kellogg Hill Road sits on a three-acre level and gently sloping corner lot in lower Weston. WESTON — Internationally renowned painter, sculptor and jewelry designer Thelma “Toby” Heller (1927-2017) took materials — like bronze, precious metals and semi-precious stones — and used her considerable talents to create works of art that are found all over the world in gallery exhibits, private collections, sculpture parks, and gardens. It seems completely fitting that the home she shared with her beloved husband Gilbert for more than 30 years started out as a humble barn that was later converted into a rustically elegant residence. The barn-style colonial with a gambrel roof at 69 Kellogg Hill Road sits on a three-acre level and gently sloping corner lot in lower Weston. It was originally built in 1929 as a cow barn for a nearby farm. Twenty years later it was transformed into a livable residence. When the Hellers purchased the property in 1985, they lovingly restored and updated the 3,468-square-foot home. Upgrades included the addition of central air conditioning and a full house generator. There is also an in-ground swimming pool and pool house on the attractive grounds, which include natural meadows and a pond. The property adjoins the Aspetuck Valley Country Club golf course. This house is also within walking distance of the Freeborn Trail and Trout Brook Valley Preserve, an open space area managed by the Aspetuck Land Trust. It features almost 14 miles of hiking trails including two trails for horseback riding. Also nearby is the Olde Blue Bird Inn restaurant on Black Rock Turnpike in neighboring Easton. A fieldstone wall borders the front and one side of the property along Kellogg Hill and Old Redding roads. As one pulls into the ample gravel driveway, several of Toby Heller’s sculptures come into sight. They are positioned throughout the property, and one is reminiscent of another sculpture she created for Durney Vineyard in California — now the Heller Estate. That winery used the whimsical sculpture of two people dancing as inspiration for the name of one of its wines, called “Dances on Your Palate,” and for the art work on that bottle’s label. A book of Toby Heller’s art work, simply titled “Toby Heller,” said, “Whether placed in private or public spaces, or being worn by individuals, her artwork enhances and enchants.” She and her husband enhanced and enchanted this house as well. On entering the front door, there is a magical feeling — probably a mix of the unusual structure and the creative people who lived there. Its next owners can create their own magic there. According to the listing agent, this house, which exudes charm and character, would make a wonderful year-round residence or second home as a weekend retreat for the buyer who wants a unique and stunning property. Inside, this house features a two-and-a-half-story great room with exposed beams, a red brick fireplace with a parson’s cabinet above it, built-in shelving, wide-planked wood floors, and a wall of windows. On the second story the doors to the original hay loft open allowing people on that level to look down into the living room. The original hook used for loading hay into the loft hangs over a central beam. Off the entrance hall there is a powder room. One wing of this main level contains a bedroom with a full bath and a den. The opposite side contains the dining room, the sizable updated kitchen, and a large screened porch. The dining room is open to the kitchen separated only by a peninsular counter that doubles as a breakfast bar for three or four. In the kitchen there is a built-in desk area, white ceramic tile backsplash, and high-end appliances including a Sub-Zero refrigerator. There is a door that leads from the porch down to the side yard and the pool. On the second floor, there is a large loft area with flexible use. For Toby Heller, it was a light-filled art studio but it could serve as a game room, family room, playroom, or media room. The master bedroom is on this floor and its sizable master bath has a backsplash of white ceramic tile interspersed with decorative hand-painted, floral-themed imported tiles. The finished walk-out lower level has an en suite bedroom, large office, and a spacious entryway, which can be a sitting or reading area. One of two doors to the yard opens first onto a covered porch. For information or to make an appointment to see the house, contact Jillian Klaff of Jillian Klaff Homes/William Raveis Real Estate at 203-858-2095 or jklaff@jilliamklaff.com.